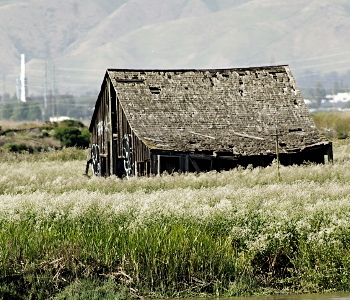 Drawbridge is a ghost town nestled on an island in the salt marshes of south San Francisco Bay. 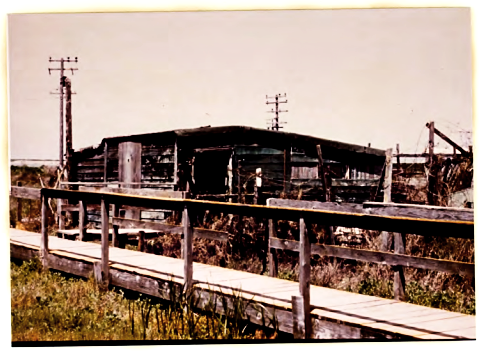 In its heyday around the 1920s, as many as 600 people visited Drawbridge on weekends to enjoy its rustic atmosphere, and to go hunting, fishing, boating and swimming. Some people remember it as a quiet, peaceful town full of nature lovers, while others claim it was a rip-roaring town full of two-fisted rowdies. Over time, residents and visitors abandoned the town. In 1979 Drawbridge saw its last resident move out. Since then, it has become a ghost town and is slowly sinking into the marshlands. Warning: No Trespassing Allowed! Drawbridge is now part of the Don Edwards San Francisco Bay National Wildlife Refuge and is no longer open to the public. It is illegal and unsafe to visit the town. Trespassers on federally-managed land may be penalized with large fines. Drawbridge can be briefly viewed from the Altamont Commuter Express, Capitol Corridor, and Coast Starlight trains. The U. S. Fish and Wildlife Service conducts a Drawbridge Van Excursion led by long-time volunteer Ceal Craig on a periodic basis. The tour does not visit the town itself; it only goes to the closest spot from which one can legally view Drawbridge. The public can legally and safely view Drawbridge from a vista point on the Mallard Slough Trail Spur. Environmental Education Center at Don Edwards San Francisco Bay National Wildlife Refuge. 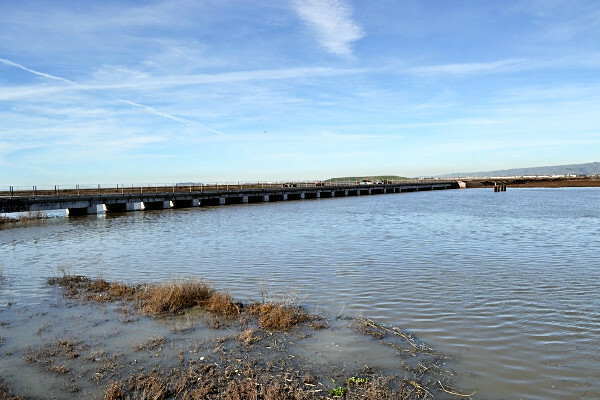 From Highway 880 or 101, exit on Highway 237 toward Mountain View/Alviso. Turn north onto Zanker Rd. and continue to the refuge entrance (a sharp right turn at Grand Blvd.). The trailhead is accessible from the Environmental Education Center parking lot. 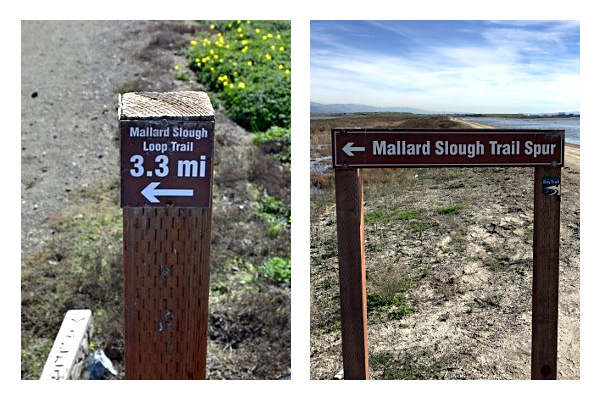 Walk through the butterfly garden or the New Chicago Marsh Trail to reach the Mallard Slough Trail. 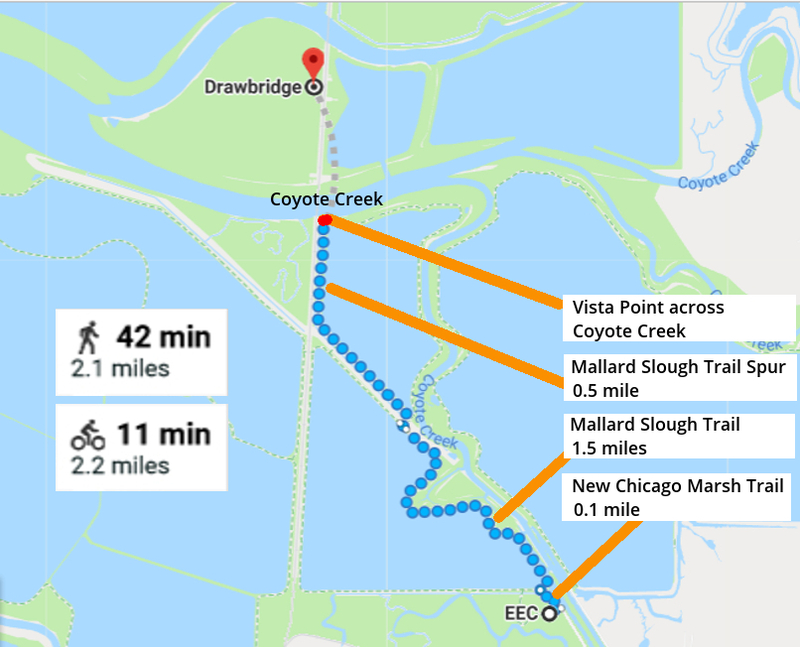 Once on the Mallard Slough Trail, walk about 1.5 miles till you reach the Mallard Slough Trail Spur. Walk 0.5 mile to the end of the Spur to view Drawbridge from across Coyote Creek. The trail needs to be dry to make walking feasible. If it has rained recently, the muddy trail might need a number of days to dry, depending on the extent of the rain. 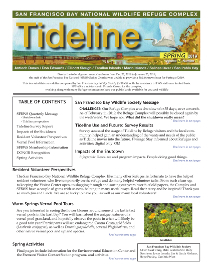 If the Environmental Education Center is open, check out the Drawbridge binder with info and photos in it. You can also download it as a PDF file (5 MB). Drawbridge as viewed from the vista point across Coyote Creek. Drawbridge as viewed from the vista point across Coyote Creek, with the railway track to the left. Drawbridge as viewed from the train. 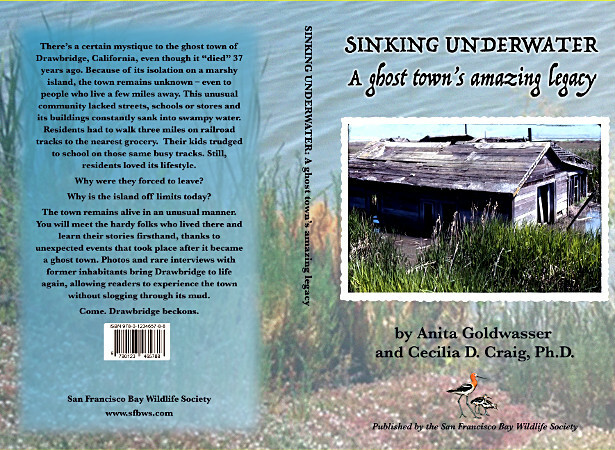 The San Francisco Bay Wildlife Society is the publisher of a book on Drawbridge titled Sinking Underwater: A Ghost Town's Amazing Legacy written by Anita Goldwasser and Cecilia D. Craig, Ph. D. The book is available for purchase online and in our Nature Stores. All proceeds from the book sale benefit the San Francisco Bay Wildlife Society. Authors: Anita Goldwasser and Cecilia D. Craig, Ph. 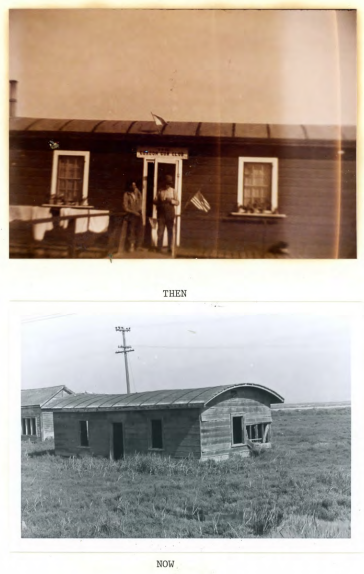 D.
Sinking Underwater: A Ghost Town's Amazing Legacy by Anita Goldwasser and Cecilia D. Craig, Ph. D. Cover illustration art by Linda Knoll. Cover photo ©2017 by Anita Goldwasser. 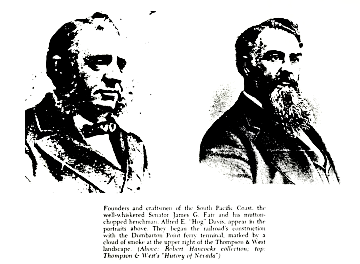 On March 25, 1876, San Francisco millionaire Alfred "Hog" Davis and Senator "Slippery Jim" Fair, who had made his money in the Comstock Silver Mine, created the South Pacific Coast Railroad. The narrow guage railroad was built to challenge the mighty Central Pacific and Southern Pacific lines. 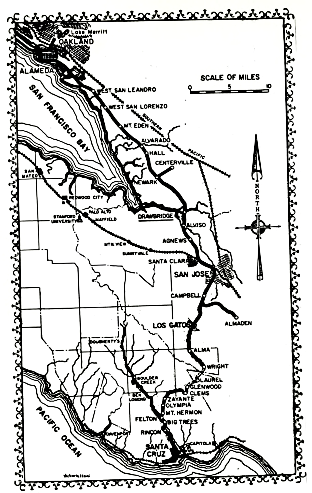 Originally the SPCR was to run from Newark to Santa Cruz with ferry service from Dumbarton Point to San Francisco. The line changed its plans and the northern terminus was moved to Alameda. 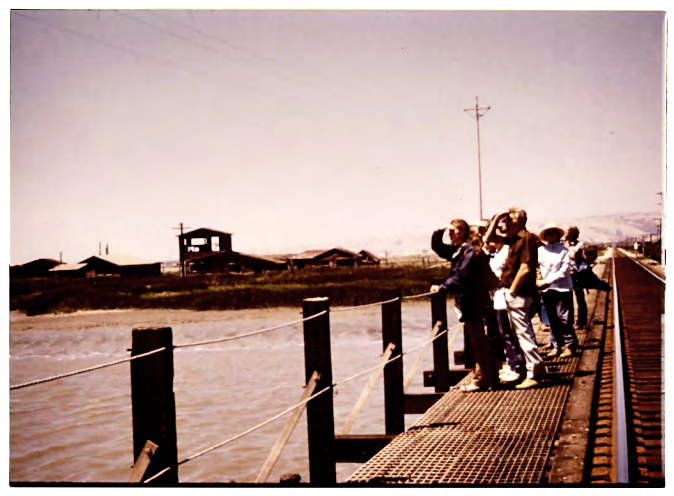 Near Alviso, the SPCR ran across a small, marshy island between Coyote Creek and Mud Slough. Scows and barges used these waterways to transport hay, grain, salt, hides, fruits and vegetables from Warm Springs and the Santa Clara Valley to San Francisco. 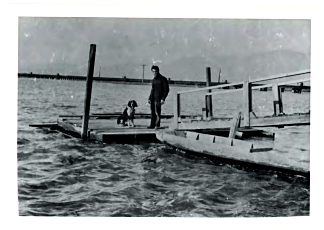 To allow for the water traffic, drawbridges were installed on each side of the island in the fall of 1876. 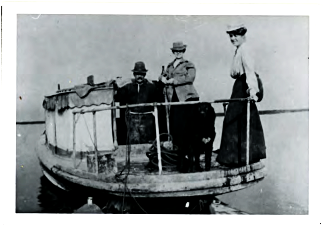 Being hand-operated, a bridge tender was stationed on the island, now called Station Island. Later it became known by its dominant feature, Drawbridge. The people who used the waterways near Drawbridge frequently took advantage of the excellent hunting and fishing. Work soon spread and visitors began arriving by the new railroad, even though there was not an official stop on the timetable. 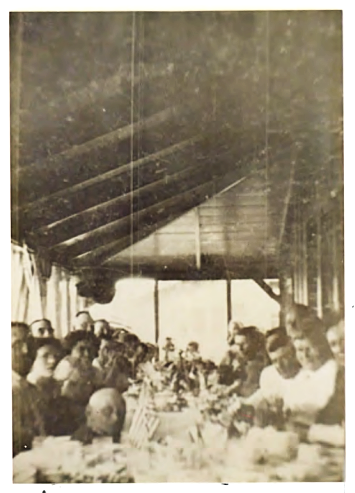 Initially, only a few came and sometimes they spent the night in the bridge tender's cabin or in a nearby baggage car. Soon many more made the trip to the island and a few built their own cabins. Now the train was making regular stops at Drawbridge. In its heyday, Drawbridge boasted 80 to 90 homes, two hotels, boat builders and many gun clubs. On weekends, as many as 600 people visited Drawbridge to enjoy the rustic atmosphere, hunting, fishing, boating and swimming. 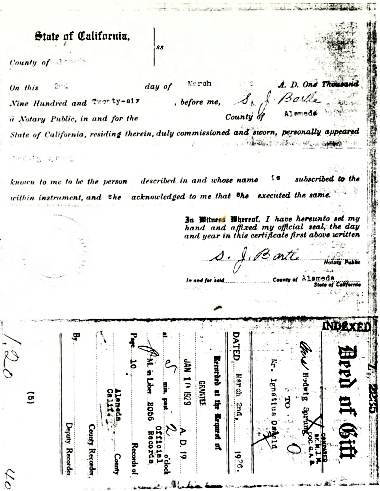 Having neither government nor law enforcement, Drawbridge acquired a reputation through newspaper accounts for gambling, bootlegging and brothels. Recollections from former residents, dating back to 1900, discount these accounts as an exaggeration. Photographs of the inhabitants and visitors show well dressed, middle class citizens. Drawbridge began its decline around 1936 with the decline of ducks. 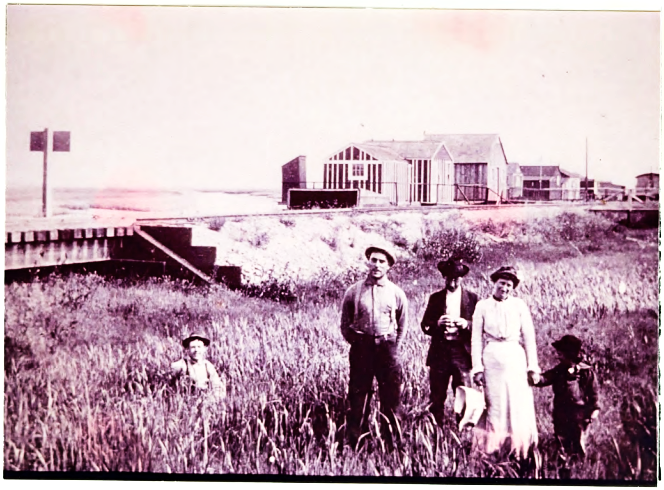 This, along with the creation of salt ponds and the dumping of sewage, changed the environment of the area. Soon the hunting and fishing were less bountiful and water pollution became a problem. The island began to sink into the marsh as wells in Drawbridge and the surrounding areas tapped the water table. The leisure activities that drew people to Drawbridge were no longer as enticing. By the 1950s, few residents remained. Many of the abandoned homes were vandalized, looted and burned. 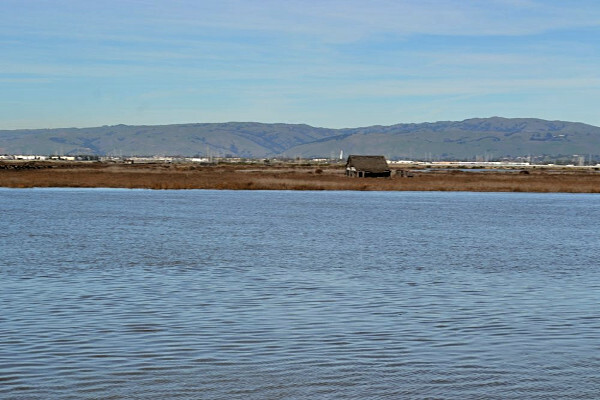 In 1972, the San Francisco Bay National Wildlife Refuge acquired 23,000 acres of the South Bay. This included Drawbridge. 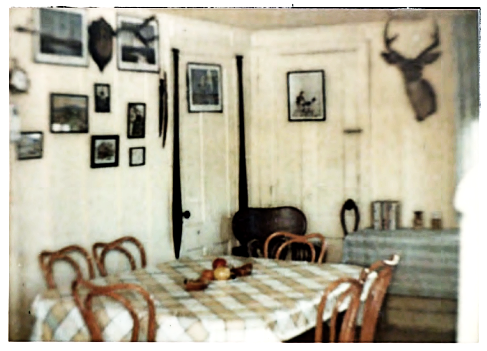 By 1979, Charlie Luce, Drawbridge's last resident, had left. The train, the Southern Pacific since 1887, still passes through but it no longer stops. Only the drawbridge on Mud Slough remains, though it is rarely opened. 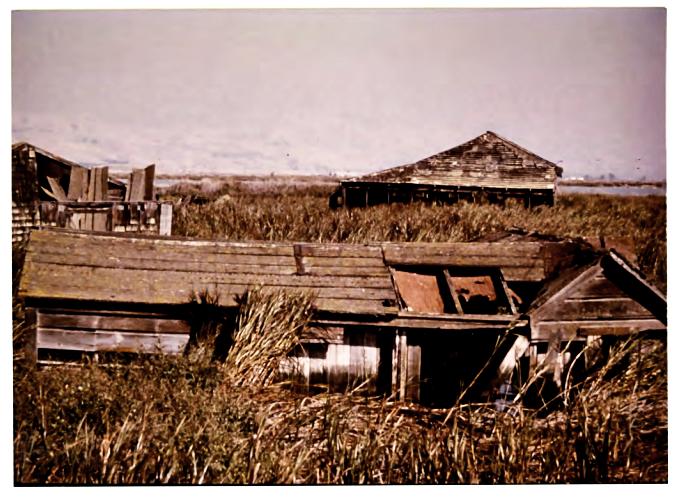 The few remaining houses are sinking into the marsh, grey with age and the elements. Some of the old salt ponds are returning to marshes. 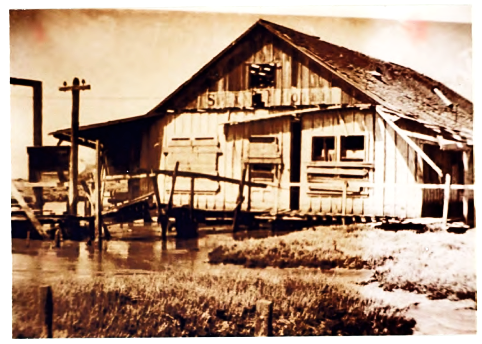 1876 - The bridges over Mud Slough and Coyote Creek were completed. Only one building stood on the island which was the bridge tender's house. 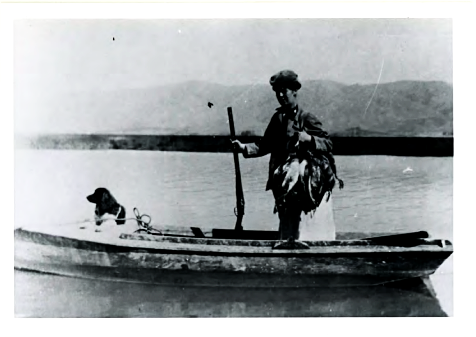 He would often charge duck hunters $.50 to spend the night there. 1880 - The first operating timetable was issued by the South Pacific Coast #8. Trains stopped at the "Drawbridges" once a week on Sun-days. 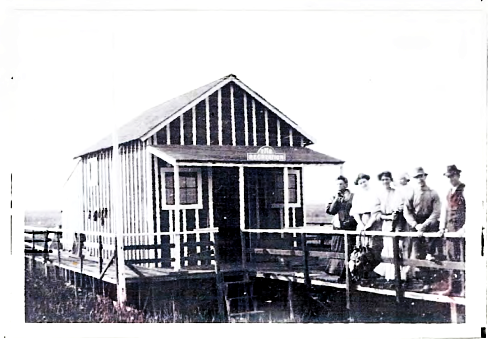 The first cabin built after the bridge tender's was constructed at this time. 1881 - The timetable drops any mention of duck hunters using the train. 1882 - Many trains were now stopping at Drawbridge. 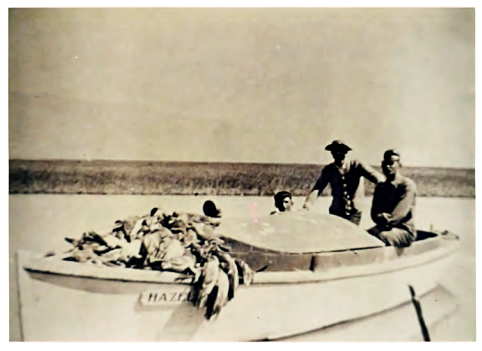 The outstanding hunting and fishing that were available from the area spurred the development of Drawbridge as a sportsmen's and vacationers community. 1883 - An Alameda newspaper made reference to "special trains" that stopped at Drawbridge specifically for duck hunters. This verified the fact that hunting was well established even in the town's early days. 1885 - The Alameda Encinal wrote that many of the hunters were indifferent as to the results and contents of their game bags. 1890 - Many buildings were now being built at Drawbridge. 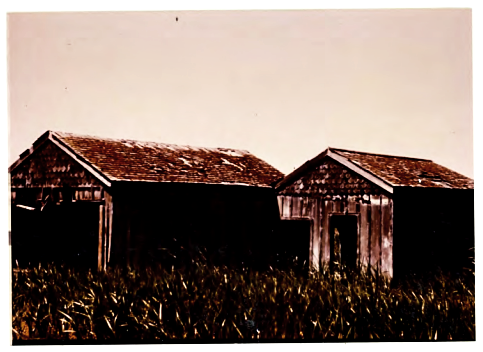 Most of these were duck hunter shacks but a few hotels were also being built. 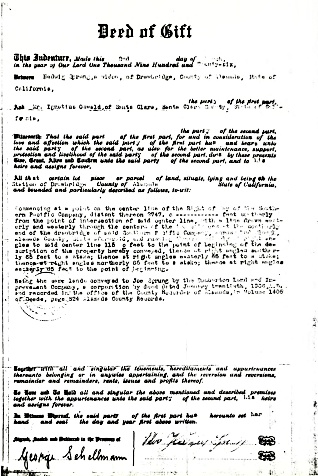 1894 - A regular Saturday night train was now available with return connections the following day. This implied that there were some sort of overnight accommodations available to travelers. 1897 - For the first time the island was made an official station on the South Pacific Coast timetable. The island was now officially called Drawbridge and a white sand paint sign was hoisted at the bridge tender's shanty. 1900 - Sprung's Hotel was opened. 1904 - A 24 hour notice was now required to open the bridges. 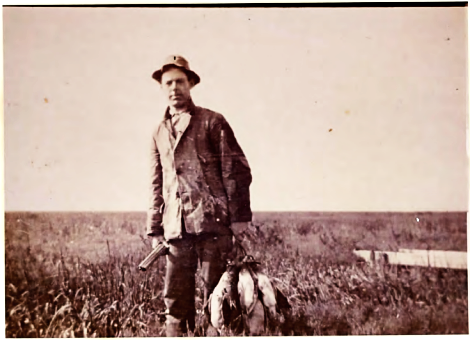 1908 - Market hunting was well established. Hunters would use canons loaded with shot, chains and nails to kill 500 to 1000 ducks in a single shot. 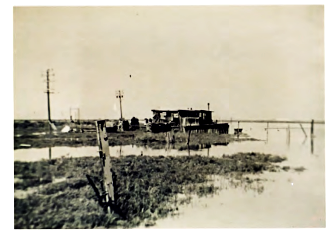 1920 - This was the beginning of the end when salt companies began to build levees and drain the marshes. This, along with increasing water pollution, hurt the hunting and fishing that attracted the people to Drawbridge. 1926 - Near the height of Drawbridge's popularity when it would have as many as 600 visitors on the weekends. 1936 - The fresh water supply began decreasing while water pollution increased. Weekend visitors and residents begin to disappear. 1940 - For the next 10 years, the few remaining residents are subjected to severe vandalism, looting and burning, of the abandoned cabins. 1963 - Fewer than 5 residents remain. A white flag must now be waved to get the train to stop. 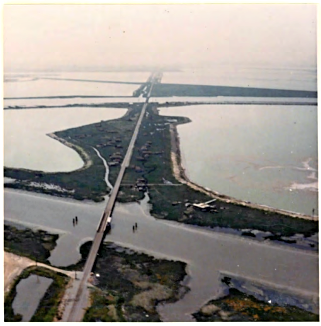 1972 - The San Francisco Bay National Wildlife Refuge acquires 23,000 acres of the South Bay, including Drawbridge. 1979 - Charlie Luce, the last resident, leaves Drawbridge. 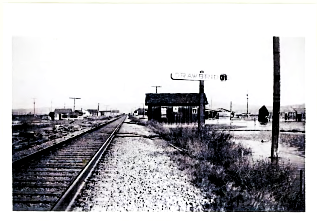 1980 - The town of Drawbridge is now a ghost town. some salt ponds are being turned back into marshland. Guided tours of Drawbridge ate available through the SFBNWR. The South Pacific Coast Railroad, founded in 1876, ran from Alameda through the Santa Cruz Mountains to the city of Santa Cruz. 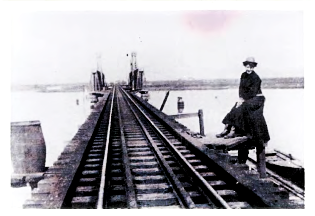 From Alameda, the line provided ferry service to San Francisco. 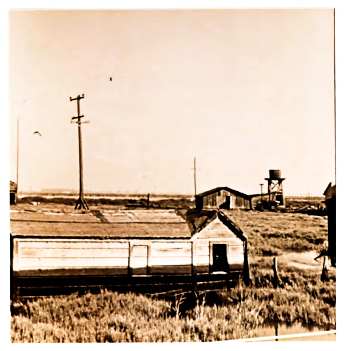 Just north of Alviso, the railroad crossed Station Island, commonly called Drawbridge. 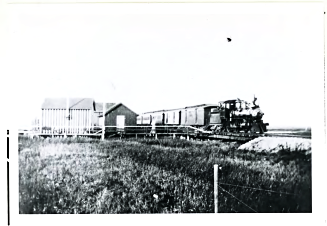 Sportsmen rode the train to Drawbridge for easy access to the excellent hunting and fishing in the area. Soon the railroad made regular runs to accommodate the increasing hunting crowds. A few stayed to build homes and a couple of hotels. At its peak, Drawbridge had 80 to 90 buildings, including two hotels and gun clubs. Drawbridge flourished from 1876 to the 1930s. It began to decline in the 1940s and by 1979 it became the ghost town it is today. When the first American settlers came into the San Francisco Bay area in the early 1800s, there were hundreds of thousands of waterfowl, thousands of deer, antelope, and elk. By 1899, most of the wildlife had been killed off by professional hunters. However, there did remain thousands of acres of wetlands and marshes, indicated in black in the above map. These areas provided vital habitat for the remaining migrating waterfowl. 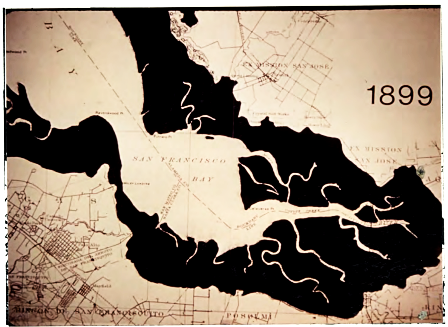 1979 map of San Francisco Bay indicates what remained of the wetlands and marshes in 1979. Little has changed since then. Landfills for towns, airports, and industry and dyked areas for salt ponds have caused a considerable decline in our wetlands. 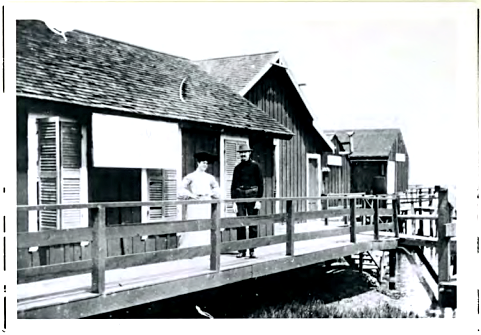 This decline severely impacted Drawbridge's popularity as a hunting and fishing resort. As a result, Drawbridge is now a ghost town. In the middle of this photograph you can see Mud Slough, creased by a still-operable drawbridge. On the far side of the island is Coyote Creek. Its drawbridge has been replaced with a trestle. The few remaining buildings can be seen on either side of the railroad tracks. This is a current aerial view of Station Island and Drawbridge. 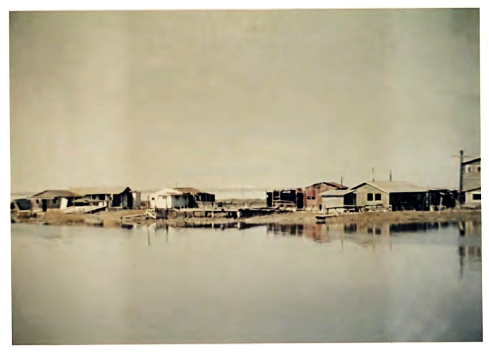 Alviso lies three miles south, which is on the left in this photograph. The narrow neck of the island near the south end was the dividing line between the "South" and "North" towns. 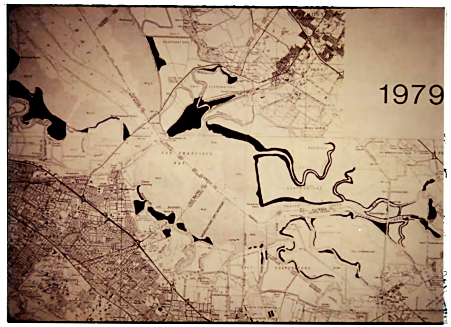 The salt ponds on the east and west sides of the island were marsh at one time. 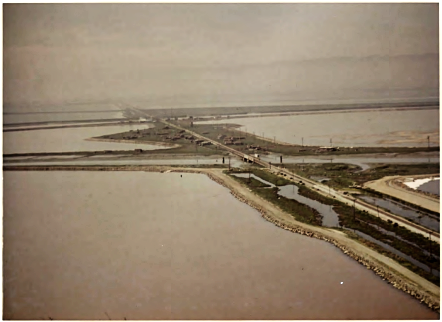 1974 - Looking north across Coyote Slough, at least half the buildings on the south end are now gone. 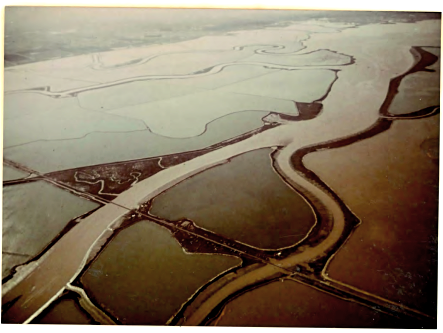 1974 - Looking south across Warm Springs Slough. The two most northerly houses have been burned down. The narrow gauge South Pacific Coast Railroad passes through Draw-bridge. The building is the Recreation, a vacation cabin. A modern Southern Pacific train heads north, across the Mud Slough bridge. This bridge can still be opened to allow water traffic to pass. In earlier days, this took less than an hour. Now it requires at least a week. 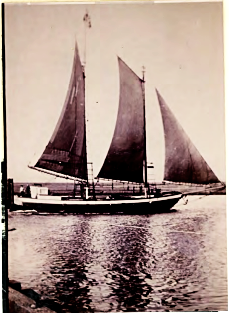 The "Newark" ferry was one of the vessels origi-nally built to transport people from the end of the railroad in Newark across the Bay to San Francisco. They were large ferries, 300 feet long, 80 feet wide, with 42 foot side wheels. 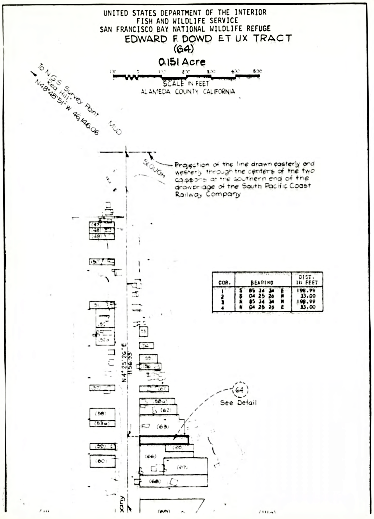 When the South Pacific Coast Railroad company changed its mind and extended the line into Alameda, the ferries were still used from Alameda. 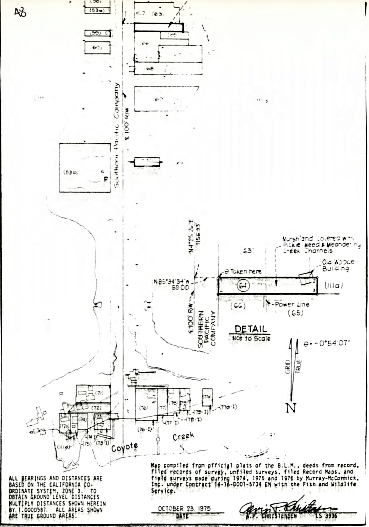 The railroad track was the "mainstreet" of Drawbridge. All the houses were built on "stilts" as were the walk ways that connected the houses to the tracks. The railroad charged the people $1.00 a year to connect the walk ways to the tracks. This photograph of the bridge over Coyote Creek was taken around 1903. Notice the double set of rails. These were installed as a safety measure in case the train derailed while crossing the creek. This bridge has since been removed and replaced by a trestle. The young lady in the picture in Ann Byrnes. 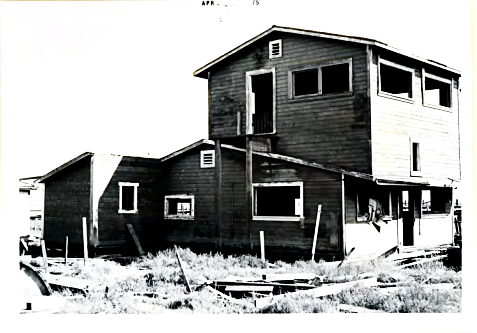 The Gordon Gun Club was the first building constructed in Drawbridge after the bridge tender's cabin. Some say it was built by a sea captain to resemble a ship's cabin. 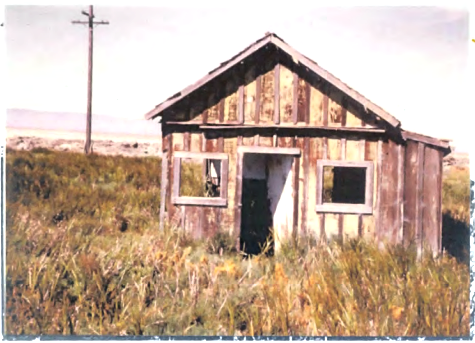 Others say that it was built by railroad men to resemble a railroad car. Both the waterways and the railroad played vital parts in the development of Drawbridge. Which story do you believe? 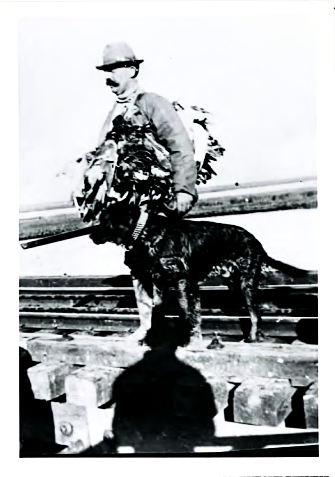 Billy Robinson, Drawbridge's boat builder, circa 1915. His cabin was located in the northwest sector of the island. Later on it was occupied by Charlie Luce, Drawbridge's last resident. The cabin was burned down by vandals during the winter of 1986. This was Billy Robinson's house, later bought by Charlie Luce. Charlie was the last person to live at Drawbridge. He left in 1979. Vandals burned his house down in 1986. 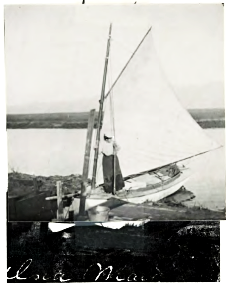 Billy Robinson, Drawbridge's boat builder, circa 1915. His cabin was located in the northwest sector of the island. Later on it was occupied by Charlie Luce, Drawbridge's last resident. The cabin was burned down by vandals during the winter of 1986. Drawbridge residents Ed Smith, his wife and Ann Byrnes enjoy an after-noon on the slough in Ed's boat. The only way to get to Drawbridge was by railroad or by boat, so nearly everyone in Drawbridge had a boat. 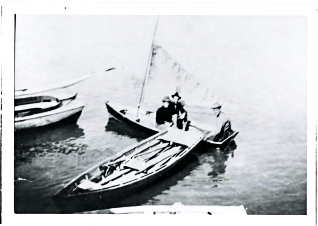 Boats were used for duck hunting as well as basic transportation. Since the wind is constant at Drawbridge, many people used sailboats. There were many different varieties and these are but two of them. The Recreation was built in 1903 by John Byrnes. It was here that he and his bride, Ann, spent their honeymoon. 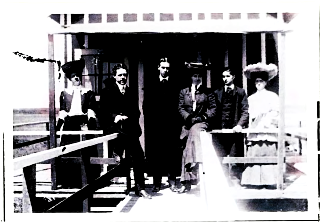 Posing in front of the Recreation are (left to right) John and Ann Byrnes, George and Jean Decker, and Joe and Belle Beasy. Ann Byrnes returns to Drawbridge after a successful hunt, and John Byrnes is not to be out done. 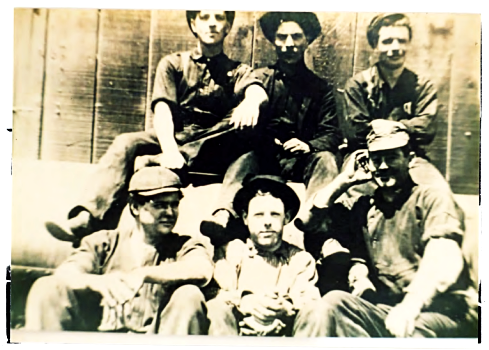 John Byrnes and his friends relax after a day at the factory. And with the same friends, John is ready to step out. 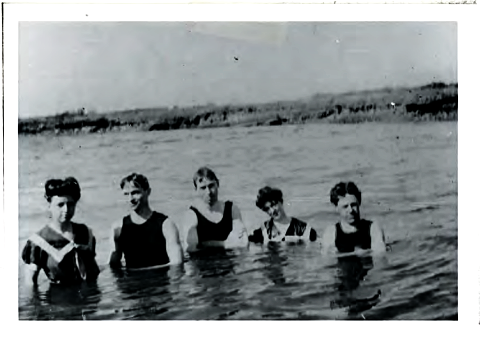 The Byrnes and their friends found swimming in The Slough, an enjoyable summertime activity. The Recreation as it appears today. Ann Byrnes and Ed Smith on the porch of the Clambake Club. This club was owned by the Skaar family. Ed Smith, a long time Drawbridge resident, was an experienced and successful duck hunter. Sprung Hotel had a good well and Mrs. Sprung sold water to many of the residents for $5.00 a year! 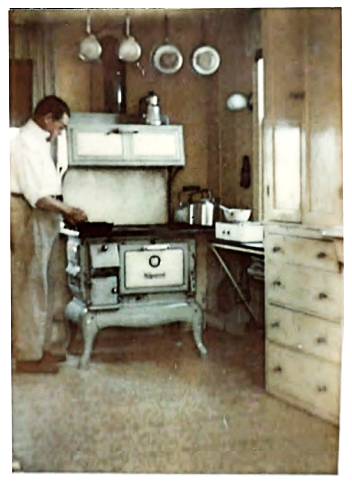 Family life in Drawbridge at the turn of the century was often idyllic. Dining inside the front porch at the Sprung Hotel. Mrs. Sprung second from right. 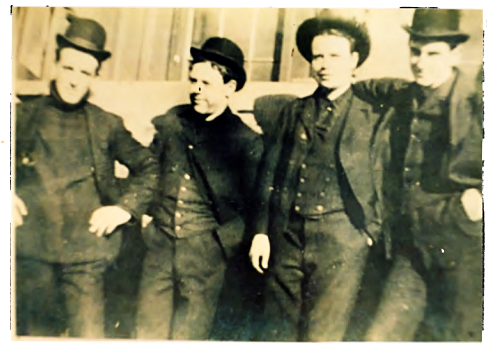 Herman Oswald third from right. Ike Oswald first at left. Fourth of July celebration. 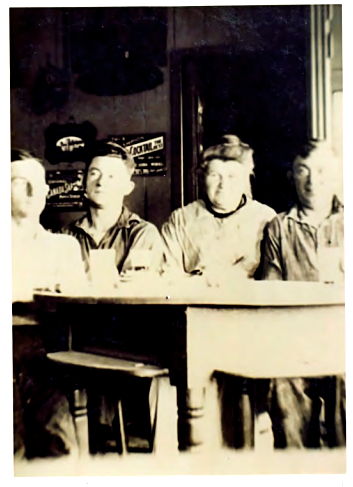 Mr. Ed Dowd second from left, Mrs. Sprung second from right. Billy Carrera on the right. In the saloon. 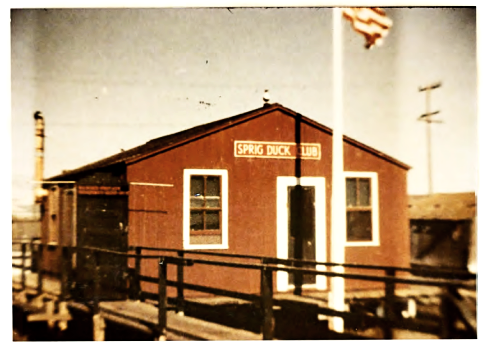 This is the Sprig Duck Club in 1961. It was owned by Mr. Ed Dowd and his wife Mary. Mr. Dowd owned an electrical company in San Francisco. This cabin was vandalized and finally burned down. 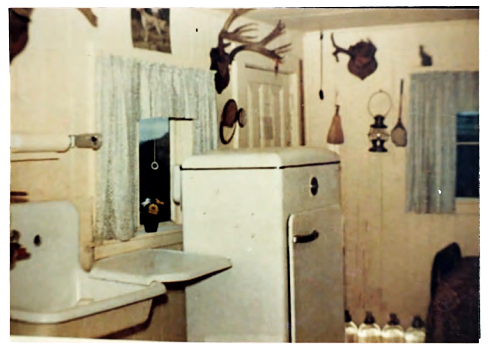 The Dowd kitchen, 1961. These pictures were donated by the daughter of Mary and Ed Dowd - who live in San Francisco. 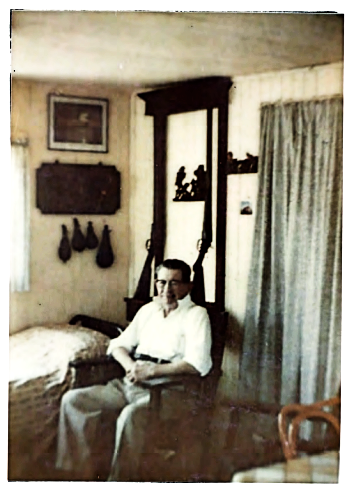 Ed Dowd in his cabin bedroom. 1961 Nellie Dollin was the last woman in Drawbridge and next to the last resident. 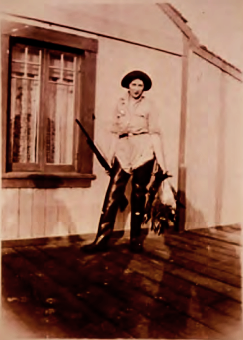 She came to Drawbridge in 1910 when she was ten years old to visit her father. She visited on and off thru the year and finally became a permanent resident. She worked in both Oakland and San Jose using the train to commute. She loved to hunt and she loved Drawbridge. Then in 1974 after a great deal of harassment and vandalism she gave up and left to move to Hayward. 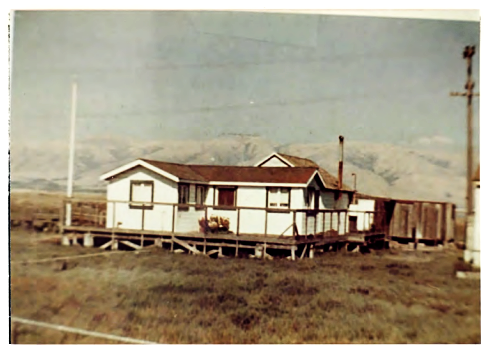 Nellie's first house as it appeared in 1961. 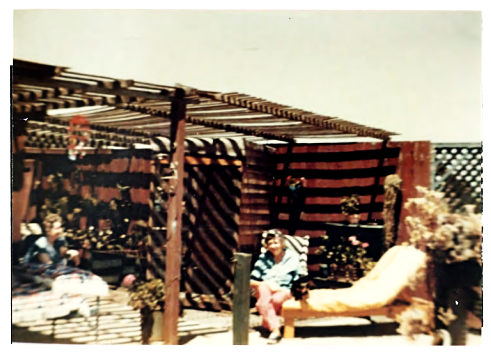 Nellie's patio in 1961 - Nellie is on the right. 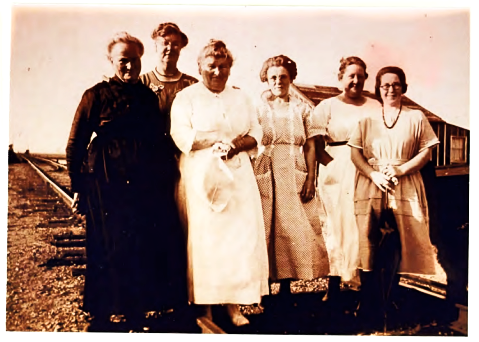 Mrs. Mary Dowd on the left. 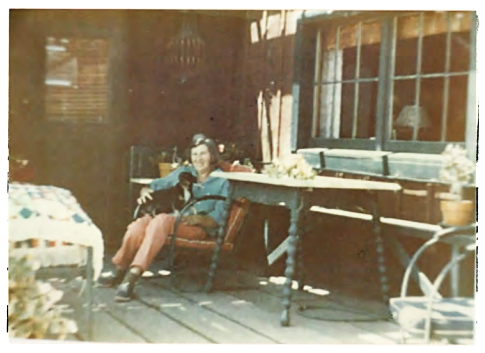 Nellie at home with her dog in 1961. Her cabin is still standing although an attempt to burn it down failed. NOTE: These pictures are of her second cabin. 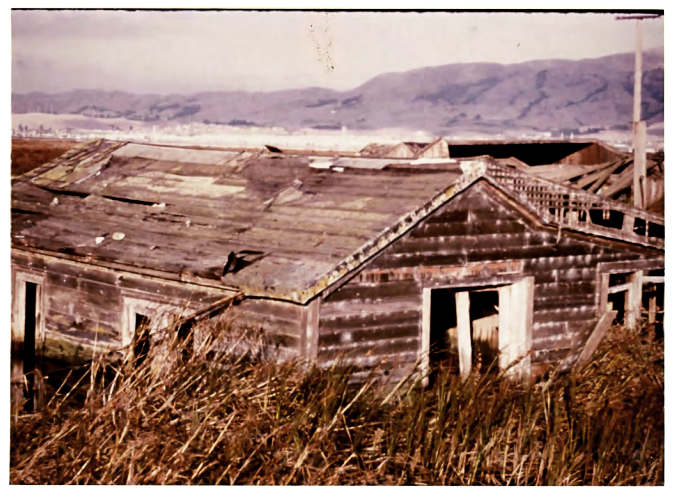 Nellie Dollin's cabin as it appeared in 1984. 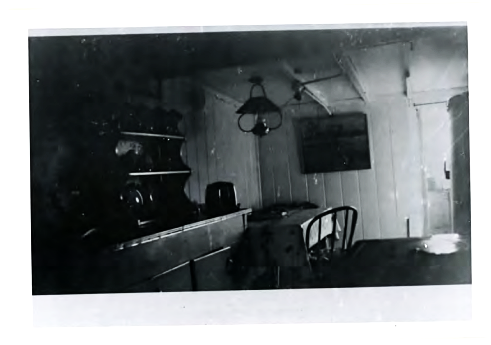 The interior of Nellie Dollin's cabin was simple but comfortable. 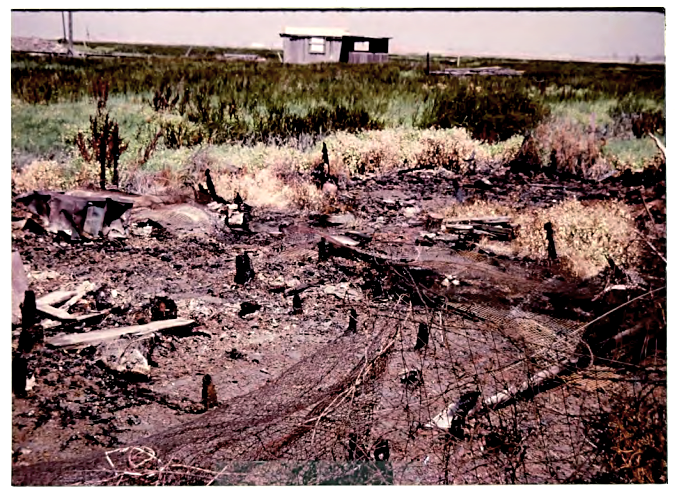 Nellie's cabin was burned down in 1984. In the background you can see Charlie Luce's cabin which was burned down in the winter of 1986. Vandalism, particularly arson, continues to be the nemesis of Drawbridge. 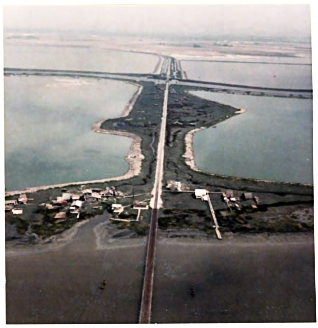 The need for pilings is evident at high tide, as this 1981 photograph shows. The two story house on the right has been burned down. Note the high water mark on this cabin that has sunk. The only two story house in Drawbridge was owned by Barney Panella. He also owned the Hunter's Home Hotel. Drawbridge is now part of the Don Edwards San Francisco Bay National Wildlife Refuge and is no longer open to the public. It is illegal and unsafe to visit the town. Trespassers on federally-managed land may be penalized with large fines. 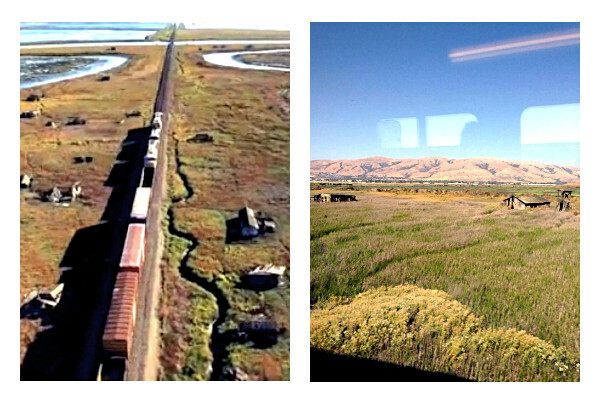 Drawbridge can be briefly viewed from the Altamont Commuter Express, Capitol Corridor, and Coast Starlight trains. The U. S. Fish and Wildlife Service conducts a Drawbridge Van Excursion led by long-time volunteer Ceal Craig on a periodic basis. The tour does not visit the town itself; it only goes to the closest spot from which one can legally view Drawbridge.